This probably isn’t politically correct but funny none the less, the booze drip. Everyone knows that laughter is the best medicine, so you need to make sure you get your daily dose of fun. The best way for you to medicate yourself would have to be this Bedside Booze Drip. Designed around a Hospitals IV drip you can fill the bottle with any drink you want and have it ready and waiting when the pains of your life, wife or strife, get to much. It comes with a stand to hang the bottle from and a long IV tube that can be places in a glass or straight in your mouth for instant relief. 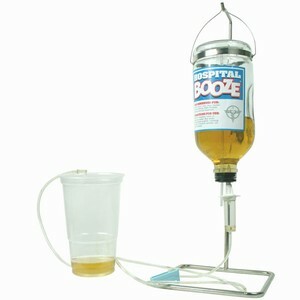 You can buy the booze drip from Drink Stuff for £12.99 (~$25) but please be sensible(ish).